A data breach incurs serious consequences no matter whether a company is big or small. Staff get fired, executives issue apologies, and entire systems are overhauled to ensure that it doesn’t happen again. They instill doubt in consumers, damage the company’s reputation, and the impact can last for years. A data breach can harm both public sentiment and a company’s competitive edge in the market. But how to investors react to data breaches? Does Wall Street punish companies that leak customer data? This is the question we will attempt to answer. We analyzed the closing share prices of 24 companies, all of them listed on the New York Stock Exchange, starting the day prior to the public disclosure of their respective data breaches. Included are many of the largest data breaches in history; all of them resulted in at least 1 million records leaked, and some surpassed 100 million. Some companies were breached more than once, for a total of 28 breaches analyzed. In the long term, breached companies underperformed the market. After 1 year, Share price grew 8.53% on average, but underperformed the NASDAQ by -3.7%. After 2 years, average share price rose 17.78%, but underperformed the NASDAQ by -11.35%. And after three years, average share price is up by 28.71% but down against the NASDAQ by -15.58%. It’s important to note the impact of data breaches likely diminishes over time. After the first month, the companies we analyzed actually performed better than they did prior to the breach. In the six months leading up to a breach, average share price grew 3.64%, compared to 7.02% following a breach. Similarly, the companies underperformed the NASDAQ by -1.53% leading up to the breach, but managed to outperform it by 0.09% afterward. The companies include: Apple, Adobe, Anthem, Community Health Systems, Dun & Bradstreet, Ebay, Equifax, Experian, Global Payments, Home Depot, Health Net, Heartland Payment Systems, JP Morgan Chase, LinkedIn, Monster, T-Mobile, Sony, Staples, Target, TJ Maxx, Under Armour, Vodafone, and Yahoo. This study was revised in August 2018 to include more companies, improve the methodology, and create better, interactive visualizations. Read about those changes here. Essentially, we anchor the NASDAQ index performance to zero. That means if a company’s stock fell 1% and the NASDAQ rose 2% in the month after a data breach, the calculated decrease is 3%. If the NASDAQ fell 2% and the company’s stock price rose 2%, we report an increase of 4%. If the NASDAQ rose 2% but the company only rose 1%, that’s a 1% decrease versus the market. Finally, if the company’s stock price falls 2% but the NASDAQ falls 3%, then the company still sees a relative increase of 1%. and how long it takes for a share price to “bottom out” after a breach. Historical stock data were downloaded on in August 2018. We analyzed all of the stocks together and then split them up by different factors to see if we could spot any patterns. These factors include the year of the breach, the size of the breach, the sensitivity of the leaked info, and the industry of the company. These findings, while insightful, are less statistically significant due to the smaller sample size. While we use daily means to present our findings in this article, we additionally include polynomial trend lines in our visualizations to better represent the data. One of the biggest limitations to this study is sample size; there aren’t many companies that fit the criteria. As with any financial market study, there is a huge slew of factors that could affect stock price which we cannot account for. While we’ve tried to minimize blindspots by comparing share price performance against that of the NASDAQ, there are bound to be some unexplained inconsistencies. Stock prices suffer following a breach, but perhaps not as much as one might assume. After 14 market days, or roughly three weeks, share prices drop -2.89% on average. After the first month, however, share prices recover, and the companies we examined actually performed better in the six months following a breach (+7.02%) than the six months prior (+3.64%). Average daily volatility across all stocks was 2.6%. The NASDAQ comparison gives a similar result. 14 market days after a breach, share price underperforms the NASDAQ by -4.6%, but after a month (about market 22 days), they’re only down -1.76% against the NASDAQ. After 6 months, the average share price performance recovers and even surpasses NASDAQ performance (+0.09% vs NASDAQ). In the longer term, share prices continue to grow, but not fast enough to keep up with the NASDAQ. After one year, share price has grown 8.53% on average, but underperforms the NASDAQ by -3.7%. 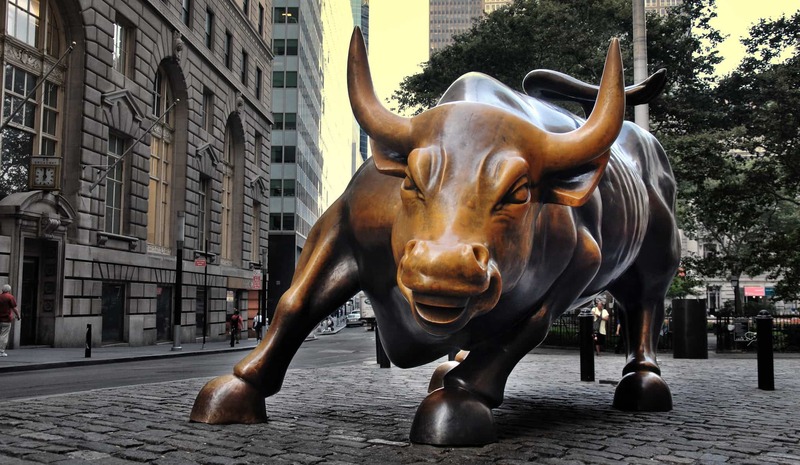 After two years, average share price rose 17.78%, but underperformed the NASDAQ by -11.35%. And after three years, share price is up by 28.71% but down against the NASDAQ by -15.58%. These findings seem to indicate that breaches have an overall negative effect on share price in the long term. However, it’s important to note two important factors that could influence the results. The first is that some of the companies we analyzed were breached relatively recently, so we don’t have a full three years worth of post-breach data for every company. The sample size at 3 years is smaller than the sample size at 6 months. Second, the further away in time we get from the breach, the more difficult it is to reasonably attribute changes in share price to said breach. In other words, we assume a data breach will have the greatest effect on share price immediately following the incident, and that effect will diminish over time. For this reason, we primarily focus on the six months before and after a breach is disclosed. In the following analyses, we grouped the stocks together by different factors. These sections will primarily focus on the difference in share price performance versus the NASDAQ—not just share price fluctuation—over one year (see above for explanation). For each group, we note this statistic for the six months prior to breach, six months post-breach, and the price and number of market days it took for the stock to “bottom out” post-breach. 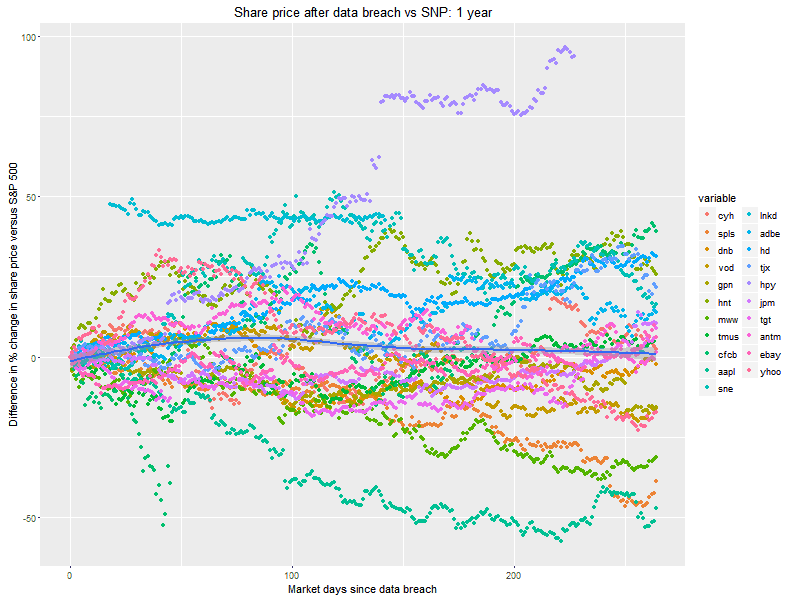 Beyond the initial change in share price, breaches didn’t seem to affect share price differently in the long term based on when they first happened. Share price performance varied too widely to discern any useful conclusion. Share prices of companies breached prior to 2012 fell sharply against the NASDAQ, but it’s worth mentioning these stocks were already performing poorly in the six months prior to their breaches. Despite the downward trend and the sharp drop in the first few weeks post-breach, these stocks still performed better on average in the six months after breach than the six months prior. Despite relatively large breaches, the average share price at these companies didn’t see any immediate loss in performance against the NASDAQ, which is why there’s no bottom. Instead, performance improved slightly and then waned slowly over the six months post-breach to slightly underperform the market. This is the exact opposite result of the older breaches, which companies took a hard initial hit to share price but then recovered to perform even better than the previous six months. Stocks that suffered breaches since 2015 initially dropped against the NASDAQ. Prior to the breach, they underperformed the NASDAQ slightly, but they recovered after their breaches to ultimately outpace the NASDAQ six months later. Note that two companies, Heartland Payment Systems (HPY) and LinkedIn (LNKD) de-listed from the stock market after their breaches. Finance-related companies were hit hard by data breaches, as one might expect. They suffered the largest initial downturn following breaches on average, sinking over 17% against the NASDAQ after 16 market days. Although the stocks performed better against the market post-breach than pre-breach, they still underperformed the NASDAQ by a difference of 2% after six months. Technology stocks collectively take a significant initial hit, although not as much as those of finance companies. The initial fall in performance was more gradual than in other categories, not bottoming out until 40 market days. Prior to the breach, these companies outperformed the NASDAQ on average, but underperformed it in the six months after. Ecommerce and social media companies weren’t performing that well on average prior to their data breaches. But in the six months following, they managed to outperform the NASDAQ market index by over 10%. That’s in spite of a fairly sharp drop in average share price directly following their breaches. Even though this category includes some of the most high-profile data breaches in history, investors were unfazed. They suffered no immediate drop in share price performance after their breaches on average, and the six months post-breach were only marginally worse than the six months prior. We only analyzed four breaches among three healthcare companies, so our results should be taken with a big grain of salt in this category. Still, we though it worth including. The breaches did not seem to have much affect on these companies. There’s no initial drop in share price, which hits a low point about three months later, but it would be difficult to attribute that to drop to the breach. Ultimately, these stocks outperformed the NASDAQ on average, and the six months after breach wasn’t much less than he six months prior. Performance is heavily swayed by the ups and downs of Health Net ($HNT). Companies that suffered bigger breaches were able to shake it off and ultimately outperform the market, whereas companies with smaller breaches lagged behind six months on. Companies that leaked a huge amount of records suffered a sharp initial drop in performance against the NASDAQ as a result. They soon recovered, however, ultimately outpacing the NASDAQ by 13%, a significant improvement on the six months prior to breach. Performance was held aloft largely thanks to Heartland Payment Systems ($HPY). We see a gradual slight decline in share price performance among these stocks after they’ve been breached, but for the most part they keep pace with the NASDAQ. Smaller breaches had a similar negative impact on share price as the largest breaches in the immediate term, but share prices failed to recover. As you would expect—but not as is the norm—they performed worse in the six months following a breach than the six months prior. These companies witnessed a sharp drop in share price performance on average in the first three weeks following their breaches. They performed worse in the six months following a breach than the six months prior, but not by much. Stock prices for these companies didn’t drop in the wake of their breaches. Average performance was influenced heavily by LinkedIn, which was sold to Microsoft and de-listed from the NASDAQ in the year after its breach. Without it, prices would see a more gradual and steady increase, but an increase nonetheless. The six months following a breach were a huge improvement on the six months prior when compared to the market. Royal Bank of Scotland (RBS) and Monster (MWW) didn’t decline immediately after their breaches, so we don’t see a sharp drop until the second week. Six months on, these companies underperformed the NASDAQ by nearly 6%, significantly worse than the six months prior. We surmise Apple’s poor performance during this period was more to do with the succession of its former CEO Steve Jobs, who died less than a year earlier, and the launch of the first iPhone since his death. Sept 17, 2017 – 143 million US consumers’ names, Social Security numbers, and dates of birth were exposed, sometimes including driver’s licenses and/or credit card numbers. Some Canadian and British customers were affected as well. We ran the same one-year overall comparison analysis that we used on the NASDAQ against the S&P 500. We did this to ensure that the NASDAQ comparison results are materially similar to other broad benchmarks. The S&P 500 is a fairly standard benchmark for overall market performance. Shifted focus to 6 months instead of 1-3 years. 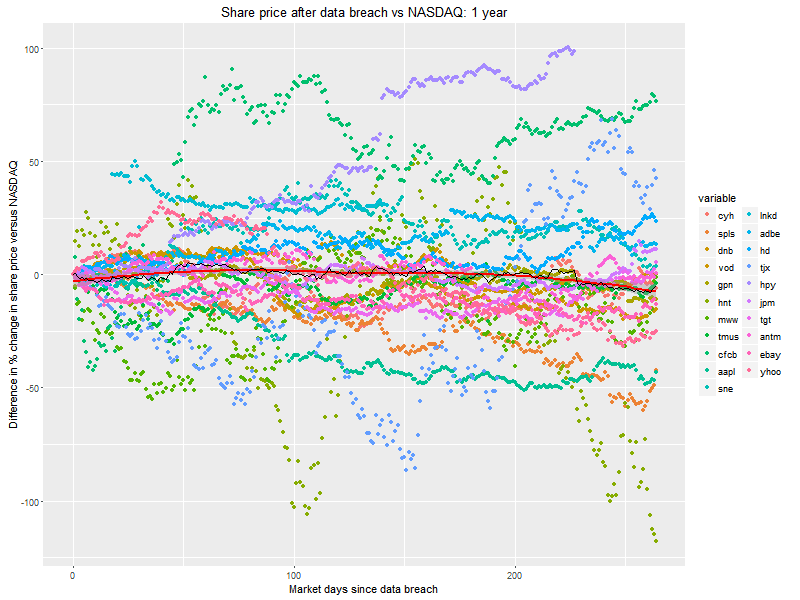 The effect of data breaches on share price diminishes over time, so we chose to look at a shorter period of time when changes in share price are more directly attributable to data breaches. Included 6 months prior to breach to compare share price fluctuations before and after breach and add context. Improved visualizations with interactive features. In the 2018 study, we noted a slower decline in performance over time than in 2017. This is most likely to do with the introduction of new companies and breaches in the data set.